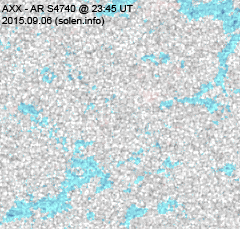 Last major update issued on September 8, 2015 at 05:10 UT. The geomagnetic field was quiet to major storm on September 7. 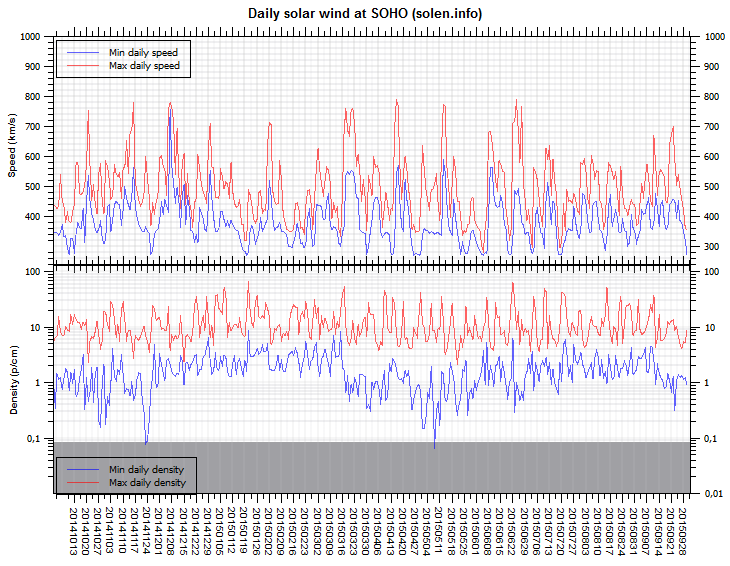 Solar wind speed at SOHO ranged between 440 and 574 km/s. 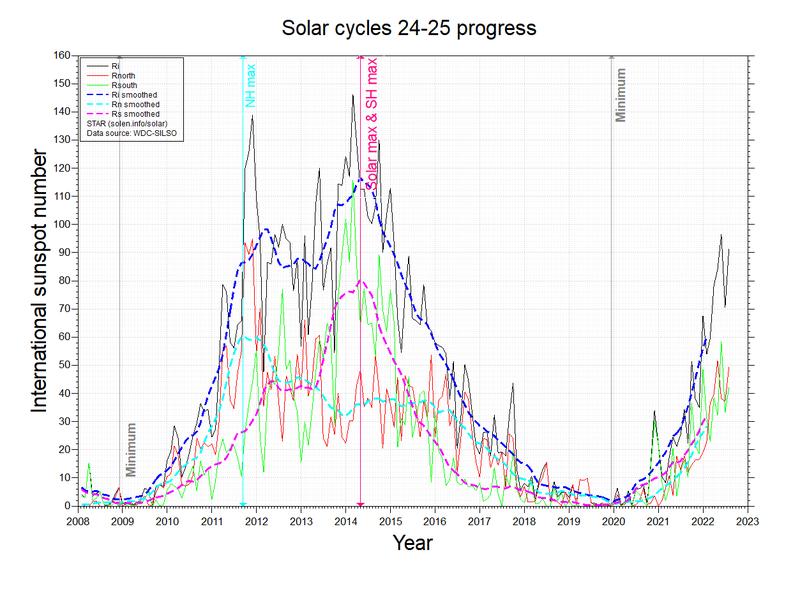 While the geomagnetic field was under the influence of a high speed stream from CH687 early in the day, significant changes in the solar wind occured after noon. Wind speed and density increased and the total field of the IMF increased while Bz swung moderately to strongly southwards. This caused minor to major geomagnetic storming for the remainder of the day. The source of the disturbance during the latter half of the day is uncertain, by far the most likely candidate appears to be a CME associated with a large filament eruption in the southeast quadrant (starting from approx. 18h UT) on September 4. Although this CME appeared to be just outside of the Sun-Earth axis, the CME may have merged with the trailing part of the CHHSS. 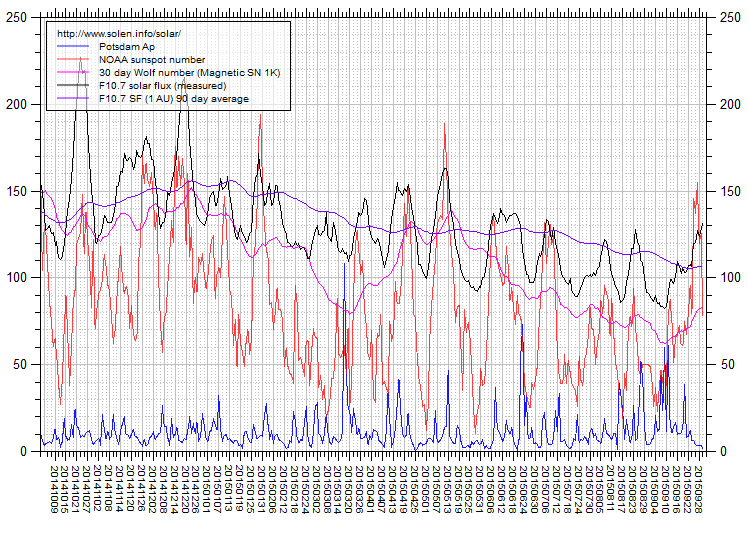 Solar flux at 20h UTC on 2.8 GHz was 83.7 (decreasing 19.1 over the last solar rotation). 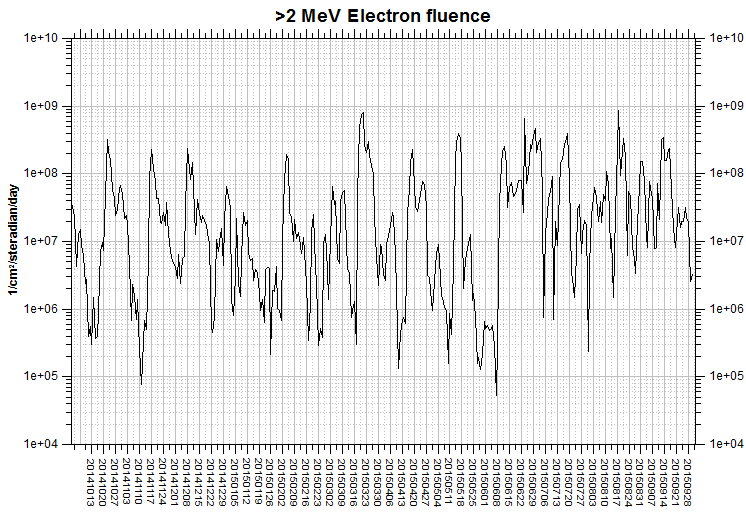 The 90 day 10.7 flux at 1 AU was 111.7. The Potsdam WDC planetary A index was 41 (STAR Ap - based on the mean of three hour interval ap indices: 40.9). Three hour interval K indices: 23435656 (planetary), 24435554 (Boulder). At the time of counting spots (see image time), spots were observed in 9 active regions using 2K resolution (SN: 124) and 5 active regions using 1K resolution (SN: 64) SDO images on the visible solar disk. Region 12409 [N05W21] decayed slowly and quietly. Region 12411 [N14E25] was quiet and stable. Region 12412 [S07E47] gained spots and was quiet. New region 12413 [N02W46] emerged early in the day with a few spots. S4740 [S23W24] was quiet and stable. New region S4743 [N06E48] emerged with a penumbra spot. New region S4744 [N08E70] emerged with a penumbra spot near the northeast limb. 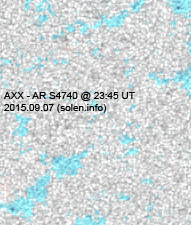 New region S4745 [S12W03] was observed with penumbra spots. New region S4746 [N20E14] emerged with penumbra spots. The leading and trailing spot sections may be 2 separate regions. 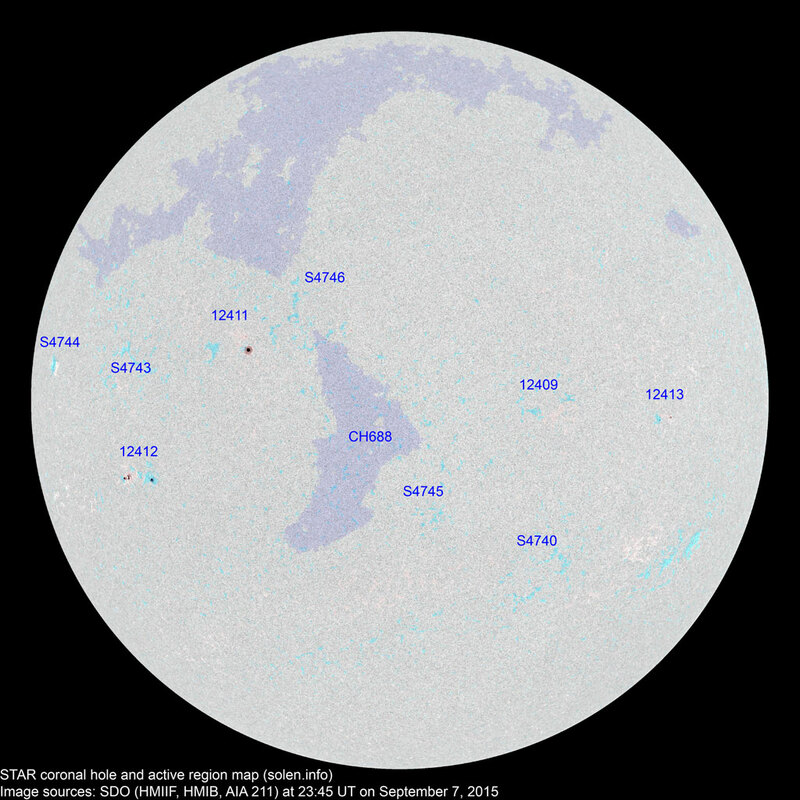 September 5-7: No obviously Earth directed CMEs were observed. 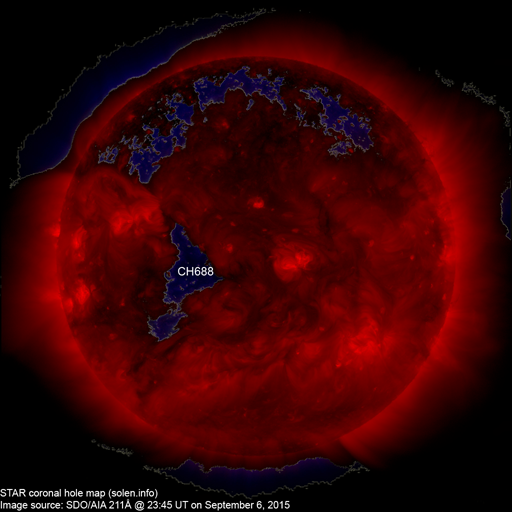 A trans equatorial coronal hole (CH688) will be in an Earth facing position on September 7-8. The geomagnetic field is expected to be quiet to active on September 8 due to CME effects and quiet on September 9. Quiet to unsettled conditions are possible on September 10-11 due to effects from CH688.